Fine attention to general operating technique with adroit handling of tissues and efficient teamwork (see the image below) can reduce operating time to a minimum and thus avoid exposing the wound for an inordinate amount of time. 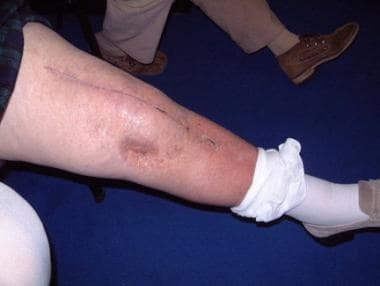 An experienced, efficient technique also aids in preventing deep venous thrombosis (DVT) and unnecessary scarring and decreases the incidence of many of the complications that are associated with TKA. Total knee arthroplasty. 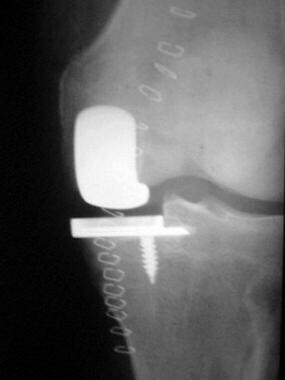 Implanted knee with excellent insertion. DVT is a major danger, particularly if it embolizes to the lung. It is therefore necessary to take appropriate precautions, such as early mobilization, thromboembolic disease stockings, foot pumps, and anticoagulant therapy. Asymptomatic DVT has been reported in as many as 50-70% of patients who undergo TKA. Postoperative ultrasonography or venography can reveal the presence of thrombi quite successfully. A study comparing mortality in patients treated by means of TKA with mortality in patients who were awaiting surgical treatment found that the patients in the former group had a significantly greater risk of death at 30 and 90 days after surgery than the patients in the latter group. Increased age was a risk factor for death after the procedure. A retrospective cohort analysis, using data from 150 patients who underwent unilateral TKA and another 150 who underwent simultaneous bilateral TKA, determined that patients in the bilateral group had 2.1 times higher overall complication rates and increased transfusion rates. Patients with a body mass index (BMI) greater than 30 had higher complication rates than those in the unilateral group, as did those with a preexisting pulmonary disorder. Also demonstrating higher complication rates were patients older than 70 years. Major long-term problems that are associated with TKA include late infection, wearing of the bearings, and loosening of the prosthesis. Periprosthetic fracture and arthrofibrosis may also occur but are less common. Research is progressing on the wear properties of the ultrahigh-molecular-weight polyethylene used in knee prostheses (see the image below). The coefficient of friction between polyethylene and cobalt-chromium alloy (commonly used for femoral components) has been reported to be between 0.03 and 0.16, with excellent wear rates. The shape and congruency of the bearing surface are important with respect to the contact between the metal component and the polyethylene. Complications of total knee arthroplasty. Advanced polyethylene wear. The mobile bearing insert (as opposed to the fixed bearing) is under continuing investigation that focuses on the contact between these two surfaces; research efforts are aimed at achieving low contact stresses so as to decrease component wear and further increase range of movement. Mobile bearing systems have much more contact area; this is seen by some as a disadvantage, because it means that there is more area to undergo wear. Compared with fixed bearings, mobile bearings have significantly lower upper and lower surface stresses. In addition, unconstrained mobile bearings have a theoretical advantage over semiconstrained mobile bearings (which allow rotation or translation) in that they avoid higher shear stresses; however, they also carry an increased risk of subluxation. Low friction is the aim in all prosthesis design. Accordingly, opportunities for improvement include developing finer polishing techniques and using better interface materials. Although ceramics are now commonly used in hip prostheses, they still are used only rarely in knee prostheses. Better grades and designs of ceramics will eventually appear. A retrospective review study assessed the effect of tibiofemoral alignment, femoral and tibial component alignment, and BMI on implant survival after total knee replacement (N = 3992; 6070 knees; minimum follow-up, 2 years). An increased failure rate was associated with a higher BMI. Failure was most likely if the orientation of the tibial component was less than 90° relative to the tibial axis and that of the femoral component was greater than 8° of valgus, and it was least likely if both the tibial component and the femoral component were in a neutral orientation. Other considerations for discussion include the sacrifice of the posterior cruciate ligament and the place of unicompartmental knee replacement. [25, 26, 27, 28] In a unicompartmental replacement procedure, it is vitally important to preserve the medial tibial plateau for later revision implantation (see the image below). It is also important to select patients who have only unicompartmental degenerative disease. Complications of total knee arthroplasty. With unicompartmental prosthesis, it is vitally important to preserve medial tibial plateau for later revision implantation. Preoperative assessment and knowledge of previous injuries and operations are important. The image below shows a previous infection of the tibia with osteomyelitis and tethering of the skin to the bone. Skin viability had to be assessed during the procedure to ensure that there would be no breakdown in the postoperative period. Complications of total knee arthroplasty. Previous infection of tibia, with osteomyelitis and tethering of skin to bone. Dislocation of a TKA can be seen in the image below, which demonstrates poor soft-tissue balancing. Inadequate spacer insertion, poor ligament balancing, excessive bone resection, or malrotation of the prosthesis can cause this to occur. Many TKAs are inserted in less-than-ideal ways. Complications of total knee arthroplasty. Dislocation demonstrates poor soft-tissue balancing. The image below shows a case with many faults that ultimately led to excessive wear and osteolysis around the stem. The femoral component was inserted in flexion, and large cysts are present behind the cemented tibial component. 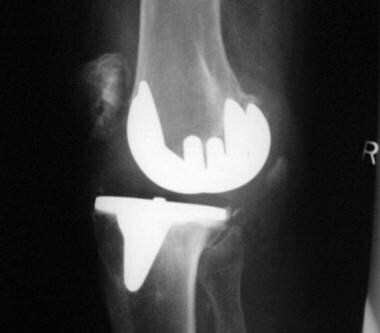 When these technical abnormalities are present in a TKA, they often result in premature failure of the prosthesis and necessitate early revision. Complications of total knee arthroplasty. Multiple faults ultimately led to excessive wear and osteolysis around stem. Radiograph shows femoral component inserted in flexion and large cysts behind cemented tibial component. Complications associated with the patellar component are another potential cause of failure after TKA. Such complications include patella tendon avulsion (often associated with a previous high tibial osteotomy); patellofemoral instability due to inadequate soft-tissue balancing; and component failure caused by factors such as a metal-backed component, recurrent instability, loosening, or fracture. Patella clunk is associated with posterior cruciate–sacrificing prosthesis designs in which the peg hits the patella. Whether fixation of components should be done with or without cement is still debated widely. Studies comparing the two methods have revealed few, if any, differences. 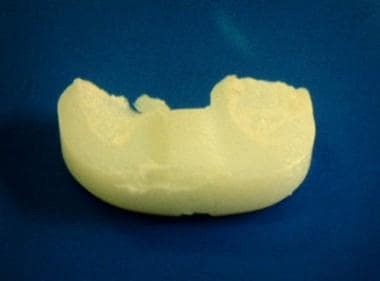 Bioactive coatings such as hydroxyapatite have been used to enhance uncemented fixation, with favorable medium- to long-term results. Prosthetic loosening is a major cause of long-term failure in TKA, developing as a consequence of osteolysis from wear-particle synovitis. Infection is a major disaster in any joint replacement. In an analysis of 11,134 TKAs by Koh et al, periprosthetic joint infection was the major cause of failed TKA. Accordingly, it is essential to diagnose infection early and treat it on an urgent basis. Saving the prosthesis is possible if early exploration and thorough synovectomy are performed. The chances of preserving the prosthesis are better if it is not cemented. In late infections, complete removal of the prosthesis, along with all components and cement, is indicated. Measurements of ESR and CRP level are important for diagnosis of chronic infection. Usually, revision of the components is required. A two-stage revision is generally preferred. A postoperative temporary (first-stage) insert can be seen in the image below. It is important to excise all infected tissue; this requires a complete synovectomy and a thorough washout with at least 10 L of isotonic sodium chloride solution. 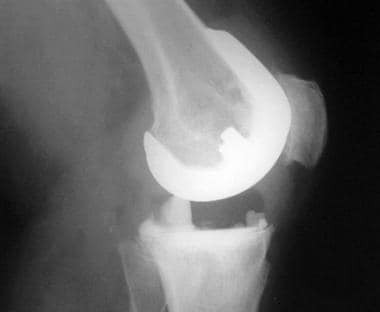 Complications of total knee arthroplasty. Postoperative temporary insert. Another study reviewed infected TKA revisions that used an articulating spacer comprising a total condylar component and a meniscal polyethylene insert cemented in place with antibiotic-loaded cement. At an average of 65 months, the Average Knee Society clinical rating for the spacers was 167; the articulating spacer in this study appeared not to require mandatory second-stage surgery. Periprosthetic fracture is a rare complication (occurring in 1-5% of cases) and is usually the result of trauma. Accordingly, it is treated on an individual basis, depending on the site and type of fracture. Other causes of fracture include notching of the femoral component and osteoporosis. In some cases, it may be necessary to insert a large-stem prosthesis. Femoral fracture is the most common type of fracture and usually occurs in the supracondylar region. Mortazavi SM, Schwartzenberger J, Austin MS, Purtill JJ, Parvizi J. Revision total knee arthroplasty infection: incidence and predictors. Clin Orthop Relat Res. 2010 Aug. 468 (8):2052-9. [Medline]. Thorey F, Stukenborg-Colsman C, Windhagen H, Wirth CJ. The effect of tourniquet release timing on perioperative blood loss in simultaneous bilateral cemented total knee arthroplasty: a prospective randomized study. Technol Health Care. 2008. 16 (2):85-92. [Medline]. Tyllianakis ME, Karageorgos ACh, Marangos MN, Saridis AG, Lambiris EE. Antibiotic prophylaxis in primary hip and knee arthroplasty: comparison between cefuroxime and two specific antistaphylococcal agents. J Arthroplasty. 2010 Oct. 25 (7):1078-82. [Medline]. Lachiewicz PF. Comparison of ACCP and AAOS guidelines for VTE prophylaxis after total hip and total knee arthroplasty. Orthopedics. 2009 Dec. 32 (12 Suppl):74-8. [Medline]. Bala A, Huddleston JI 3rd, Goodman SB, Maloney WJ, Amanatullah DF. Venous Thromboembolism Prophylaxis After TKA: Aspirin, Warfarin, Enoxaparin, or Factor Xa Inhibitors?. Clin Orthop Relat Res. 2017 Sep. 475 (9):2205-2213. [Medline]. Garfinkel JH, Gladnick BP, Roland N, Romness DW. Increased Incidence of Bleeding and Wound Complications With Factor-Xa Inhibitors After Total Joint Arthroplasty. J Arthroplasty. 2018 Feb. 33 (2):533-536. [Medline]. Singh JA, Jensen MR, Harmsen WS, Gabriel SE, Lewallen DG. Cardiac and thromboembolic complications and mortality in patients undergoing total hip and total knee arthroplasty. Ann Rheum Dis. 2011 Dec. 70 (12):2082-8. [Medline]. Schrama JC, Espehaug B, Hallan G, Engesaeter LB, Furnes O, Havelin LI, et al. Risk of revision for infection in primary total hip and knee arthroplasty in patients with rheumatoid arthritis compared with osteoarthritis: a prospective, population-based study on 108,786 hip and knee joint arthroplasties from the Norwegian Arthroplasty Register. Arthritis Care Res (Hoboken). 2010 Apr. 62 (4):473-9. [Medline]. Abularrage CJ, Weiswasser JM, Dezee KJ, Slidell MB, Henderson WG, Sidawy AN. Predictors of lower extremity arterial injury after total knee or total hip arthroplasty. J Vasc Surg. 2008 Apr. 47 (4):803-7; discussion 807-8. [Medline]. Bayne CO, Bayne O, Peterson M, Cain E. Acute arterial thrombosis after bilateral total knee arthroplasty. J Arthroplasty. 2008 Dec. 23 (8):1239.e1-6. [Medline]. Parry MC, Smith AJ, Blom AW. Early death following primary total knee arthroplasty. J Bone Joint Surg Am. 2011 May 18. 93 (10):948-53. [Medline]. Fabi DW, Mohan V, Goldstein WM, Dunn JH, Murphy BP. Unilateral vs bilateral total knee arthroplasty risk factors increasing morbidity. J Arthroplasty. 2011 Aug. 26 (5):668-73. [Medline]. Putman S, Argenson JN, Bonnevialle P, Ehlinger M, Vie P, Leclercq S, et al. Ten-Year Survival and Complications of Total Knee Arthroplasty for Osteoarthritis Secondary to Trauma or Surgery: A French Multicentre Study of 263 Patients. Orthop Traumatol Surg Res. 2017 Dec 29. [Medline]. Schmalzried TP, Callaghan JJ. Wear in total hip and knee replacements. J Bone Joint Surg Am. 1999 Jan. 81 (1):115-36. [Medline]. Archibeck MJ, Jacobs JJ, Roebuck KA, Glant TT. The basic science of periprosthetic osteolysis. Instr Course Lect. 2001. 50:185-95. [Medline]. Bunting D, Kampa R, Pattison R. An unusual case of pigmented villonodular synovitis after total knee arthroplasty. J Arthroplasty. 2007 Dec. 22 (8):1229-31. [Medline]. Weng YJ, Hsu RW, Hsu WH. Comparison of computer-assisted navigation and conventional instrumentation for bilateral total knee arthroplasty. J Arthroplasty. 2009 Aug. 24 (5):668-73. [Medline]. Manzotti A, Pullen C, Confalonieri N. Computer-assisted alignment system for tibial component placement in total knee replacement: a radiological study. Chir Organi Mov. 2008 Jan. 91 (1):7-11. [Medline]. Molfetta L, Caldo D. Computer navigation versus conventional implantation for varus knee total arthroplasty: a case-control study at 5 years follow-up. Knee. 2008 Mar. 15 (2):75-9. [Medline]. Dutton AQ, Yeo SJ, Yang KY, Lo NN, Chia KU, Chong HC. Computer-assisted minimally invasive total knee arthroplasty compared with standard total knee arthroplasty. A prospective, randomized study. J Bone Joint Surg Am. 2008 Jan. 90 (1):2-9. [Medline]. Alcelik IA, Blomfield MI, Diana G, Gibbon AJ, Carrington N, Burr S. A Comparison of Short-Term Outcomes of Minimally Invasive Computer-Assisted vs Minimally Invasive Conventional Instrumentation for Primary Total Knee Arthroplasty: A Systematic Review and Meta-Analysis. J Arthroplasty. 2016 Feb. 31 (2):410-8. [Medline]. Ritter MA, Davis KE, Meding JB, Pierson JL, Berend ME, Malinzak RA. The effect of alignment and BMI on failure of total knee replacement. J Bone Joint Surg Am. 2011 Sep 7. 93 (17):1588-96. [Medline]. Hanssen AD, Stuart MJ, Scott RD, Scuderi GR. Surgical options for the middle-aged patient with osteoarthritis of the knee joint. Instr Course Lect. 2001. 50:499-511. [Medline]. Lee GC, Lotke PA. Management of intraoperative medial collateral ligament injury during TKA. Clin Orthop Relat Res. 2011 Jan. 469 (1):64-8. [Medline]. Harato K, Bourne RB, Victor J, Snyder M, Hart J, Ries MD. Midterm comparison of posterior cruciate-retaining versus -substituting total knee arthroplasty using the Genesis II prosthesis. A multicenter prospective randomized clinical trial. Knee. 2008 Jun. 15 (3):217-21. [Medline]. Svärd UC, Price AJ. Oxford medial unicompartmental knee arthroplasty. A survival analysis of an independent series. J Bone Joint Surg Br. 2001 Mar. 83 (2):191-4. [Medline]. Berger RA, Della Valle CJ. 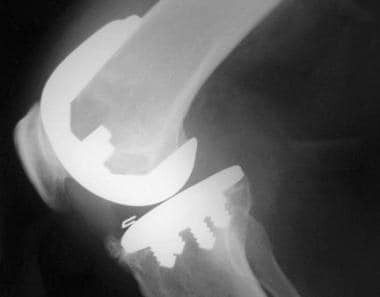 Unicompartmental knee arthroplasty: indications, techniques, and results. Instr Course Lect. 2010. 59:47-56. [Medline]. Small SR, Berend ME, Ritter MA, Buckley CA. Bearing mobility affects tibial strain in mobile-bearing unicompartmental knee arthroplasty. Surg Technol Int. 2010 Apr. 19:185-90. [Medline]. Haddad B, Khan W, Mehta V, Mbubaegbu C, Qamar A. Bilateral Simultaneous Total Knee Arthroplasty: A Patient-Matched Retrospective Observational Study. Open Orthop J. 2015. 9:499-503. [Medline]. Sobh AH, Siljander MP, Mells AJ, Koueiter DM, Moore DD, Karadsheh MS. Cost Analysis, Complications, and Discharge Disposition Associated With Simultaneous vs Staged Bilateral Total Knee Arthroplasty. J Arthroplasty. 2018 Feb. 33 (2):320-323. [Medline]. Berend KR, Morris MJ, Skeels MD, Lombardi AV Jr, Adams JB. 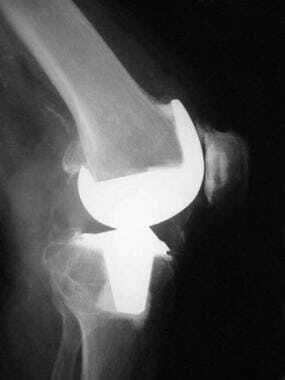 Perioperative complications of simultaneous versus staged unicompartmental knee arthroplasty. Clin Orthop Relat Res. 2011 Jan. 469 (1):168-73. [Medline]. Grace JN, Rand JA. Patellar instability after total knee arthroplasty. Clin Orthop Relat Res. 1988 Dec. (237):184-9. [Medline]. Browne JA, Hanssen AD. Reconstruction of patellar tendon disruption after total knee arthroplasty: results of a new technique utilizing synthetic mesh. J Bone Joint Surg Am. 2011 Jun 15. 93 (12):1137-43. [Medline]. Hungerford DS, Krackow KA, Kenna RV. Cementless total knee replacement in patients 50 years old and under. Orthop Clin North Am. 1989 Apr. 20 (2):131-45. [Medline]. Koh CK, Zeng I, Ravi S, Zhu M, Vince KG, Young SW. Periprosthetic Joint Infection Is the Main Cause of Failure for Modern Knee Arthroplasty: An Analysis of 11,134 Knees. Clin Orthop Relat Res. 2017 Sep. 475 (9):2194-2201. [Medline]. Bedair H, Ting N, Jacovides C, Saxena A, Moric M, Parvizi J, et al. The Mark Coventry Award: diagnosis of early postoperative TKA infection using synovial fluid analysis. Clin Orthop Relat Res. 2011 Jan. 469 (1):34-40. [Medline]. Chiang ER, Su YP, Chen TH, Chiu FY, Chen WM. Comparison of articulating and static spacers regarding infection with resistant organisms in total knee arthroplasty. Acta Orthop. 2011 Aug. 82 (4):460-4. [Medline]. Trezies A, Parish E, Dixon P, Cross M. The use of an articulating spacer in the management of infected total knee arthroplasties. J Arthroplasty. 2006 Aug. 21 (5):702-4. [Medline]. Kurosaka K, Tsukada S, Seino D, Morooka T, Nakayama H, Yoshiya S. Local Infiltration Analgesia Versus Continuous Femoral Nerve Block in Pain Relief After Total Knee Arthroplasty: A Randomized Controlled Trial. J Arthroplasty. 2016 Apr. 31 (4):913-7. [Medline]. Kumar A, Chambers I, Maistrelli G, Wong P. Management of periprosthetic fracture above total knee arthroplasty using intramedullary fibular allograft and plate fixation. J Arthroplasty. 2008 Jun. 23 (4):554-8. [Medline]. Aaron RK, Scott R. Supracondylar fracture of the femur after total knee arthroplasty. Clin Orthop Relat Res. 1987 Jun. (219):136-9. [Medline].